Thanks FSFD - if it remains negative for a week or two, what's your prediction for the impact of this, given the present climatic conditions around Aus? Cut off lows not making it to the mainland bringing dry and windy conditions to the southern half of Australia. Anyway away from the humour, I am enjoying reading the different perspectives on the current situation and outlook, while different parts of Australia are suffering with floods, fire, and drought, trying to understand the reasoning and trend is very interesting. Trades have backed off to near neutral along the equator. Looking at current circulation charts suggests this isn't because the westerlies have backed off so much as they have moved south of the equator. Very strong westerly activity is forecast to commence in the next day or three, as the area of westerly activity moves back north a little. What is curious is the warming in the far east. Satellite images suggest substantial warming not just near the equator, but all along the South American coast. Trade winds along the equator in the east are normal, maybe a little stronger than normal. On the larger scale the strength of the SE Pacific high is relatively normal, although it had been stronger than normal for much of the last year or three. The SE Pacific does seem to be backing away from a La Nina like mode to be pretty neutral at the moment. At the same time the NE Pacific had been backing away from el nino like towards neutrral, but seems to be surging back towards el nino like with the current westerly activity extending also towards California. Maybe its just short term and the trend away from el nino like will continue there. 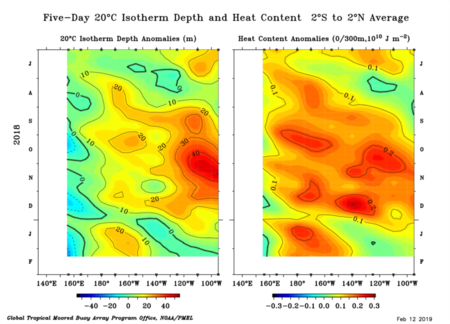 Subsurface along the equator suggests a cool wave reaching the American coast making the eastern warming more puzzling. However a look at what is happening a little south of the equator shows that there has been strong westerly activity in the Central Pacific, and possibly a warm Kelvin wave that is now impacting the east coast. Not sure if a wave can transmit effectively this far from the equator, and with low resolution of TAO the appearance of a wave could be coincidental. The strength of the forecast WWB may push the western warm pool further east, and may also act to cool it down directly through evaporation, so it will be interesting to see if this combined with whatever is causing the eastern warming will move the current pattern away from Modoki like to a more east based warm event. ...a bit of chatter around about the possibility of a "hybridised" nino...a mixture of canonical and modoki. Apek, Yu and Qian " Why were the 2015/16 and 1997/98 extreme El Ninos different?". I'm not making any claims that the dynamics are the same for the current situation. "enso-modokised with a tint IOD minus AAO divided by MJO"
some of these climate cycles run for decades and even longer. nino is a short term cycle in my mind and while obviously useful some of these other influences deserve more focus and recognition, rather than diluting the enso definitions further. my opinion as a novice anyway. "....... but maybe the nino vs nina concept is flawed. I'm thinking that it is a measuring tool that works less accurately than we all thought. At least for Australia, or maybe we should never even specify "Australia" in terms of rainfall variation, is it just too big to generalize? The monthly and seasonal climate outlook from BoM has been updated again today. I won't mention about the climate influences as others on this forum could do it better than me. But I will pose a challenging question. If one goes to the BoM webpage for rainfall outlook for the chances of exceeding median rainfall it brings up the usual coloured map of Australia and colour legend. This has the chance from brown very low chance to deep blue very high chance of exceeding median rainfall. All good it tells us based on historical median rainfall (1990 to 2012) for those months what is the BoM seasonal outlook model indication of chance of above or below that historical median rainfall for the relevant month or season of the year. On the bottom left of that map there is button with different layers that can turned on and off. Click that button and you will see a layer called ocean mask. Turn that layer off and the colour shading for chance of exceeding rainfall extends out over ocean areas. So BoM’s seasonal outlook model ACCESS S model can produce seasonal estimates of rainfall over the oceans. But how do they assess chance of exceeding median rainfall over the oceans – there are practically no gauges over vast areas of the ocean? What data set is used to define historical median rainfall over the ocean ? I can only assume that it may be based on some climate reanalysis product. If the historical median rainfall over the ocean is based on some climate reanalysis product, then that is different to the historical median rainfall over the land that is based on the AWAP (Australian Water Availability Project). So we would expect a potential discontinuity may be possible at the coastline. It does seem to be a bit of a mystery that the seasonal outlook can show chance of exceeding median rainfall over the ocean. Outlook is based on the Access C model. Used to be POAMA. They could calculate medians based on model output, or on observations. Hopefully if the model is calibrated correctly both should be pretty much the same, and for areas were observations are lacking they can use the model output. There are satellite monitoring products that measure rainfall over the ocean, not sure how accurate they are. Mike I think you mean ACCESS S model. I don't know if they could calculate medians from the model output. My understanding is that the reference period for median rainfall over land is 1990 to 2012 AWAP data. I doubt (but do not know for sure) that the routine seasonal updates (re-runs of the ACCESS S model) would give the output for 1990 to 2012 period sufficiently calibrated (to what data could be used anyway) to use as a reference for median 1990 to 2012 rainfall over the ocean. Is this large burst of westerly wind going to be borderline south of the area that brings on Kelvin waves? I was reading another forum that are going on and on about it, but a stormsurf chart seems to indicate it will barely get in the Kelvin wave generation region. 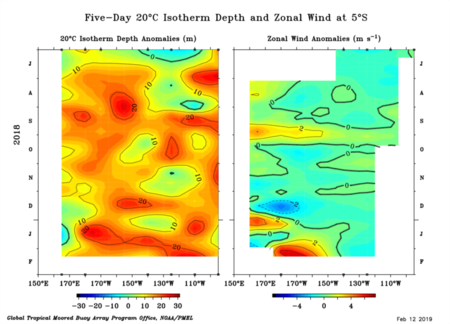 Forecast shows extensive westerly anomalies through Kelvin wave generation region. 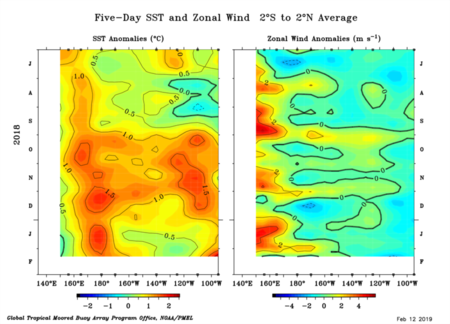 Some Stormsurf charts are not updating, and the forecast chart showing westerlies mostly south of Kelvin wave generation region is over one week old. And yes Flowin I meant Access S.
If you do know what is happening to our society, look at your local weather station very carefully!!!!! If the following is too long so be it !!!!! Adelaide weather conditions have tended to become more humid, since about the end of the 20th century. Part of this is due to effects of increasing levels of carbon dioxide [CO2] in the lower troposphere and stratosphere, and the consequences of these for variations in water-vapour. The gas form of CO2 is a linear-shaped air molecule with four  covalent -- shared -- electron bonds between two  oxygen atoms, and a central carbon atom. All air molecules that have or can have a permanent or temporary electric dipole moment are capable of absorbing infrared [IR] electromagnetic [EM] radiation. As gaseous CO2 is intrinsically linearly-shaped, it does not have a permanent electric dipole moment. However, when it absorbs IR EM radiation from the Earth, CO2 experiences bending and stretching of its internal molecular bonds. This bending and stretching of bonds is known as a vibrational mode, and happens in particular IR EM radiation wavelength bands. Both bending and stretching vibrational modes must be asymmetric for there to a change in the electric dipole moment, and subsequent absorption of IR EM radiation. Asymmetry can be achieved when bending and stretching is not centralised around the carbon atom. Thus, IR wavelength EM radiation bands must produce asymmetry upon interacting with the CO2 gas. IR EM radiation with wavelengths peaking at about 15 [15.5 to 16.5 microns] and about 4.3 microns respectively produces the bending and stretching IR vibrational modes for CO2. IR EM radiation is of terrestrial origin; from the Earth's surface. Therefore, it has longer wavelengths [in microns] and a less-intense wavelength integration [total EM emitted over total terrestrial IR spectrum] than radiation with a higher frequency. Higher-frequency radiation includes sunlight, x-rays, uv-rays, gamma rays or cosmic rays. There is less energy emitted [in Watts per square metre per micron] in the IR spectrum than in the visible spectrum, between approximately 0.7 and 0.4 microns. As the gas form of water -- water-vapour -- is an oxygen atom with two  covalent hydrogen bonds, the molecule has a V-shape. The hydrogen atoms are drawn closer together because the single covalent bonds lead to instability in molecular form. In nature hydrogen is stable as the H2 molecules, while helium is a noble gas. Thus, H2O has a permanent electrostatic polarisation, the oxygen atom being the negative end; the hydrogen atoms the positive. When H2O molecules encounter other H2O molecules, they can align electro-statically. The phase -- solid, liquid or gas -- in which they align is temperature-dependent. Two  other major differences between vapour forms of CO2 and H2O molecules: they have different atomic masses relative to the mean air mass, and CO2 cannot condense in the troposphere, while H2O can. CO2 has an atomic weight (relative to the 28 units average for air at sea-level pressure), of 44 units, which means it is heavier than air. In comparison, water-vapour is about 18 units, which means it's lighter than air. Therefore, overall, H2O is more buoyant than CO2 in the troposphere. The differences in atomic masses and abilities to condense in the troposphere -- between CO2 and H2O -- mean that CO2 can influence the surface air temperature, without condensing, which will influence the behaviour of H2O. As the temperature increases at the surface -- due to IR EM radiation absorption by CO2, the amount of water-vapour the air can retain changes (on average, increases), which is why the surface temperature changes. This happens in a day-by-day loop. The capability of the weather layer (troposphere) to retain water-vapour is temperature-dependent. This is called the Clausius-Clapeyron Equality. This summary is an extension of that theory. Water-vapour gets into the air (lower troposphere) by evaporation (water to steam), transpiration (photosynthesis) and sublimation (ice to steam). Latent-heat is the energy required to change a given mass of material from one state (solid, liquid or gas) to another. Water molecules absorb external heat -- sunlight -- when they become liquid (from ice), or steam (from liquid), and release it when they become liquid (from steam) or ice (from liquid). More latent-heat is gained from the air in sublimation because ice crystals evaporate directly, and change in phase twice. When latent-heat (at the altitude clouds form) condenses on cloud-forming particles, more energy is lost to the atmosphere surrounding clouds, bringing the immediate environment (near clouds) towards a temperature equilibrium (cloud temperature falls, that of the surrounding air rises). This continues further up into the troposphere until rising thermal air currents cool to the temperature of the air surrounding them, at which point they no longer rise. Clouds block sunlight from reaching the surface to varying degrees. The deeper clouds are (their optical depth) the more sunlight is reflected. Sunlight is the highest-intensity (frequency) radiation from the Sun to reach the Earth's surface (per micrometre, or micron). A micron is 0.000001 metres, a bandwidth in the energy spectrum. This means different parts of the energy (electric and magnetic) spectrum have different properties (which have either visible or invisible effects), which can be measured. The greater the frequency of EM radiation, the more impact it can have on air molecules behaviour. Thus, regardless of what is beneath cloud formations, energy will be lost to space or higher-atmospheric levels (stratosphere, mesosphere, and so on), and not reach the ground or sea, if they are absent. The atmosphere (all of it, from space to the surface) is very transparent to incoming light (it travels straight through it), hence light is mostly unblemished in intensity when it reaches the surface. Sunlight has the energy required (and available) to break water-molecule bonds (on the ground/in the sea) to help evaporation along. The energy per unit micron in sunlight is far greater than per micron in infrared radiation (different part of the energy spectrum), which comes from the Earth. Thus, evaporation is not possible without sunlight – water must first be boiled before it can leave the Earth’s surface as steam. Non-water-vapour molecules (that can also absorb heat) can absorb and emit infrared heat between each other, and with water-vapour, however the energy they emit will not be enough (per micron) to break water-molecule bonds. As water-vapour mostly resides in the troposphere, the absorbed and emitted heat must also reside here to break these bonds. All heat-absorbing gases contribute to the air (troposphere) temperature, however only water droplets (in clouds) and cloud forming particles can affect the amount of sunlight reaching the surface. Of heat-absorbing gases in the troposphere, only water-vapour condenses under current atmospheric conditions. This means all other IR heat-absorbing gases cannot naturally change phase (from solid to liquid or gas) in the air, no matter how much the temperature changes. Thus, if the air temperature increases with more non-condensers added, this will mean more water-molecule bonds will break away, because more heat is added to the system, with the same amount of incoming sunlight. The addition of any gas that can absorb heat (from any source) to the troposphere will increase its temperature. On the other hand, as more thermals form clouds, or deeper clouds, these will lead the temperature to fall more (beneath them). Therefore, the gap between high and low day-time and night-time temperatures -- the diurnal temperature range -- will increase, because the expansion and shrinking of the atmosphere (pressure and density) is temperature-dependent, as is the water-vapour retaining ability. Cloud-cover changes thus have a major impact on ocean and atmospheric heat storage. The atmosphere can only retain so much heat because air has a finite heat capacity and volume, so whatever is stored in the atmosphere as heat will eventually be emitted back to space. Clouds can also prevent (more-so over open water) air from heating up a lot because they reflect the high-intensity light from the Sun away from the surface. This means there can be big differences in air temperatures (near the surface) across land areas, and the sea. Water-vapour thus can help regulate the temperature of the atmosphere through the Clausius-Clapeyron Equality. So basically water vapour absorbs way more IR heat than CO2 ever can right ? Also you introduce a factor that is not recognized under the current dogma and that is electro magnetism and the effects so far unrecognized under the current regime of only TSI coming into the equation of climatic effects. UV effects on Ozone and concurrent climatic effects that are so far unaccounted for under the current human only effects of climate change looked for under the IPCC regime. I'm not joking, go take a look at their Mandate. marakai said "No other Science is ever looked into as an alternate cause." More than half of the observed increase in global mean surface temperature (GMST) from 1951 to 2010 is very likely due to the observed anthropogenic increase in greenhouse gas (GHG) concentrations. The consistency of observed and modeled changes across the climate system, including warming of the atmosphere and ocean, sea level rise, ocean acidification and changes in the water cycle, the cryosphere and climate extremes points to a large-scale warming resulting primarily from anthropogenic increases in GHG concentrations. Solar forcing is the only known natural forcing acting to warm the climate over this period but it has increased much less than GHG forcing, and the observed pattern of long-term tropospheric warming and stratospheric cooling is not consistent with the expected response to solar irradiance variations. There you have it, the IPPC does in fact look at natural climate drivers. So marakai, go take a look at their Mandate. And of Solar forcing the only factor taken into account is TSI as stated above. WMO and the United Nations Environment Programme established the Intergovernmental Panel on Climate Change (IPCC) in 1988. The role of the IPCC is to assess, on a comprehensive, objective, open and transparent basis, the scientific, technical and socio-economic information relevant to understanding the scientific basis of risk of human-induced climate change, its potential impacts and options for adaptation and mitigation. The IPCC does not carry out research nor does it monitor climate-related data or other relevant parameters. It bases its assessment mainly on peer reviewed and published scientific/technical literature. Generated in 0.031 seconds in which 0.009 seconds were spent on a total of 13 queries. Zlib compression disabled.